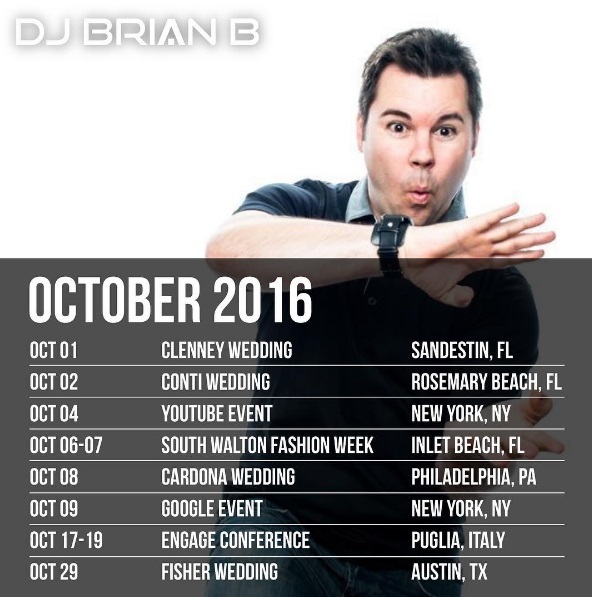 The official DJ Brian B October 2016 Schedule is inked! I kick it off tomorrow and I couldn’t be more ready to crush some events. This always ends up being the busiest month of the year for me. For a lot of the country, the humidity is OVER (praise God!) and the weather is perfect. Tons of weddings outside, a few corporate events, South Walton Fashion Week (which is open to the public) and the Engage Conference in Italy! Let’s get this month started already.